How and Where to Buy Spiriva Respimat Extended Release Online? When you’re ready to place your order for Spiriva Respimat Extended Release, as long as you have a valid prescription from your doctor, you can order it right here on www.CanadianPharmacyWorld.com, How To Order with a valid prescription from your doctor. If you’d like to speak with someone about the medication, or to place your order, simply dial 1-866-485-7979. Our pharmacy technicians will happily assist you. Are there Alternative Names for the Brand and Generic Spiriva Respimat Extended Release? Spiriva Respimat Extended Release is the brand name drug manufactured by Boehringer and the generic equivalent is called tiotropium. What Dosages and Forms is Spiriva Respimat Extended Release available in? We only carry the brand name Spiriva Respimat Extended Release inhaler in the 2.5 mcg/4 ml/60 dose. What is Spiriva Respimat Extended Release used for? 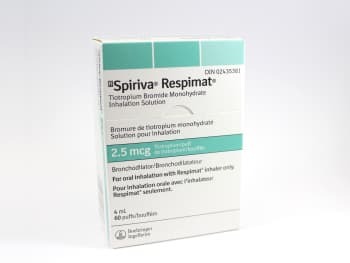 Spiriva Respimat is an inhaler medication used to treat lung diseases such as chronic obstructive pulmonary disease (COPD), which includes both bronchitis and emphysema. When used regularly, the inhaler works to enlarge the airways to allow for easier breathing, preventing wheezing and shortness of breath. This is not a rescue inhaler, so you may be prescribed a quick-relief inhaler, to supplement Spiriva Respimat. What are the Possible Side Effects of Spiriva Respimat Extended Release? Most medications will come with side effects. Before deciding if Spiriva Respimat Extended Release is right for you, take a closer look at what you might expect. Are there any Precautions and Drug interactions of Spiriva Respimat Extended Release? You should not use the Spiriva Respimat Extended Release if you’re allergic to tiotropium. Be sure to talk to your doctor if you are using the above medication, and those you start or stop while on Spiriva Respimat. Store Spiriva Respimat Extended Release at room temperature away from extreme heat, light, and moisture. Throw away the inhaler after 3 months of its first use. Using Spiriva Respimat may cause dizziness or blurred vision. Do not drive until you know how your body reacts to it. Avoid drinking alcohol, as it can worsen these symptoms. Be sure to carry a rescue inhaler, as Spiriva Respimat will not stop sudden breathing problems once they’ve started. The elderly should use this inhaler with caution, as they may be more sensitive to its effects. If you are pregnant, planning to become pregnant, or nursing – talk to your doctor about using Spiriva Respimat and whether it’s safe for you. Do not store in the bathroom. Keep out of the reach of children.